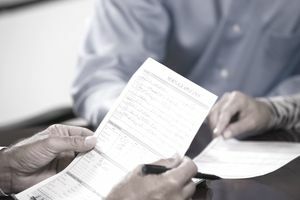 What Information Do I Need for a Business Loan Application? to pay off an existing loan. Information about the management of the business. For 100% of the ownership, you must include name and address and percentage owned. You may also be required to provide demographic information (race, ethnicity, veteran status, gender); this information can help the bank determine if you qualify for any special SBA loan programs. A resume of each executive, board member, and other key employees may also be requested. Personal and financial information about all shareholders (with 20% or more of ownership), officers, partners, owners, including a personal financial statement. Detailed information about assets being presented as collateral. For example, a legal description of real estate, serial numbers/id numbers for all large value machinery, equipment, furniture and fixtures, inventory records, accounts receivable aging reports. and other records as required. A brief history of the company and the benefits that it will gain from the funds. One to three years of projected financial information on the business, showing the effects of the funds. Finally, you will be required to provide information about the financial history of the business for the past three years, if possible, including income tax returns balance sheets, and income statements. Some of this information may be provided in your business plan, but make sure it is available somewhere to your lender or the SBA.